We enhance your event with a real eye-catcher! 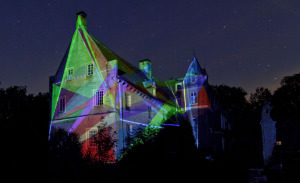 With our interactive facade projection Flashlines we create stunning effects with hardly any preparation time. Flashlines is scalable from small sets to gigantic settings and as it involves the spectators there will be unforgettable moments. Whether a street, a square or single objects: we turn your place into a unique work of light-art. The constantly changing light stage is guaranteering attention from visitors and passers-by. Our projections emerge on-site, so we save the cost-intensive pre-production.